Father’s Day is just around the corner, have you thought about what to get dad? We all know our dads, and all dads are different. 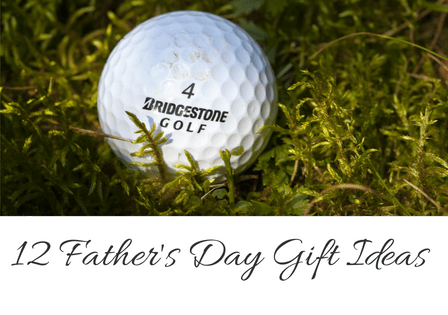 I have thought of 12 Father’s Day gift ideas to share with you. My dad is a sports dad, he likes football, basketball, and baseball. We live in Indiana, and we love our sports, especially basketball. The first organized basketball game in Indiana was played in my hometown of Crawfordsville. My dad is cap and T-shirt guy, getting him a gift seems easy. Almost too easy, I feel like I have a repeat gift every year. If you don’t have extra time to shop around. That’s okay, I’ve done it for you. Each picture below is linked to Amazon (ad) where you can find these fabulous items. 1. How about a T-shirt, jersey or cap with his favorite sports team logo. 2. Tickets for the family to watch his favorite sports team play. In June baseball is in season, so wrap those tickets in a box of cracker jacks. 3. A season pass to the local municipal or country club for golf or fishing. Maybe a prepaid 18 holes of golf, just don’t forget to add balls. 4. Does your dad like to golf? He may need that driver he’s been dreaming of. 6. How about a beer fridge for his man cave. 7. Is he a white-collar guy, how about a nice pen. 9. Beer growlers for his homemade brew. 10. Or maybe a wallet. My husband likes the bifold. 11. Does your dad like to grill? How about a grill set. 12. Or a nice chair to enjoy the outdoors. There you have it, folks. I thought of 12 Father’s Day gifts. I hope your dad has an amazing Father’s Day. No matter what you get him, he will love it. A homemade card, a visit, or just thinking of him. Click here to see more great things. Great list of gifts! I just hope I get to see my dad! I think I’m gonna do number 2 this year and get my husband tickets to an MLB game! Awesome suggestions! Been wondering what to get him!